where is the electric field due to the charged particle, is the induced dipole moment in the neutral particle (determined by quantum mechanics), and is the polarizability, which defines for a neutral atom in a uniform static electric field. See Draine, section 2.4 for more details. Deriving an interaction rate is tricker than for neutral-neutral collisions because in general. So, let’s leave out an explicit n and calculate a rate coefficient k instead, in . So, if , the average time between collisions is 16 years. Recall that, for neutral-neutral collisions in the diffuse ISM, we had years. Ion-neutral collisions are much more frequent in most parts of the ISM due to the larger interaction cross section. Short range forces involving “neutral” particles (neutral-ion, neutral-neutral) are inherently quantum-mechanical. Neutral-neutral interactions are very weak until electron clouds overlap ( cm). We can therefore treat these particles as hard spheres. The collisional cross section for two species is a circle of radius r1 + r2, since that is the closest two particles can get without touching. So we see that density matters much more than temperature in determining the frequency of neutral-neutral collisions. Collisional coupling means that the gas can be treated in the fluid approximation, i.e. we can treat the system on a macrophysical level. We will discuss (3) and (2) below; for ion-electron and ion-ion collisions, see Draine Ch. 2. These collision coefficients can occasionally be calculated analytically (via classical or quantum mechanics), and can in other situations be measured in the lab. The collision coefficients often depend on temperature. For practical purposes, many databases tabulate collision rates for different molecules and temperatures (e.g., the LAMBDA databsase). For more details, see Draine, Chapter 2. In particular, he discusses 3-body collisions relevant at high densities. Note: units for are . This is a fundamental concept in radio astronomy. Note that the above definition assumes that the index of refraction in the medium is exactly 1.
which is the integrated intensity of a blackbody of temperature . is the Stefan-Boltzmann constant. is defined by the slope (in log-log space) of an SED. Thus is the temperature of a blackbody that has the same ratio of fluxes at two wavelengths as a given measurement. Note that for a perfect blackbody. In the “hot” ISM is characteristic, but when (where are the Doppler full widths at half-maxima [FWHM]) then does not represent the random velocity distribution. Examples include regions dominated by turbulence. can be different for neutrals, ions, and electrons because each can have a different Maxwellian distribution. For electrons, , the electron temperature. is the temperature which, when plugged into the Saha equation, gives the observed ratio of ionization states. Note that in stellar interiors, . In this room, , but . is a special case of for spin-flip transitions. We’ll return to this when we discuss the important 21-cm line of neutral hydrogen. is the temperature of a blackbody having the same mean frequency as the observed continuum spectrum. For a blackbody, . This is a useful quantity for young stellar objects (YSOs), which are often heavily obscured in the optical and have infrared excesses due to the presence of a circumstellar disk. 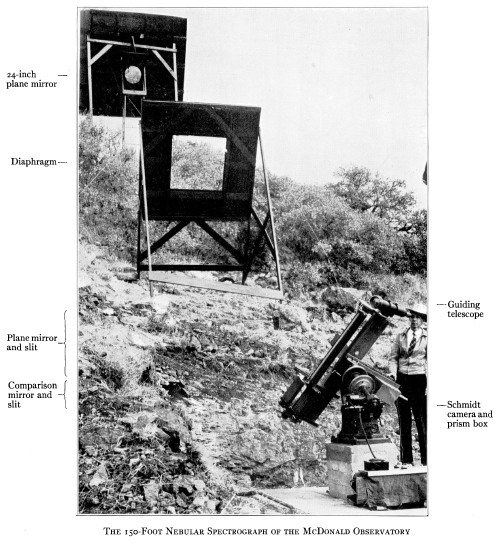 where is the telescope efficiency (a numerical factor from 0 to 1) and is the optical depth. In Bart Bok’s 1977 paper Dark nebulae, globules, and protostars (Bok 1977), largely based on a lecture given upon acceptance of the Astroomical Society of the Pacific’s Bruce Medal, he presents two fundamentally different pictures of star formation. The first, constituting the majority of the paper’s discussion, occurs in large Bok globules which are compact, rounded and remarkably well-defined regions of high-extinction ranging from 3′ to 20′. The globules show a strong molecular hydrogen and dust component and relatively little signs of higher neutral HI concentrations than its surroundings. In contrast, Bok briefly examines star formation in the Magellanic Clouds which show a vast amount of neutral atomic hydrogen and a comparatively small amount of cosmic dust. In this review, I will summarize a number of key points made by Bok, as well as provide additional information and modern developments since the paper’s original publishing. In 1908, Barnard drew attention to “a number of very black, small, sharply defined spots or holes” in observations of the emission nebula Messier 8 (Barnard 1908). 39 years later Bok published extensive observations of 16 “globules” present in M8 as well others in Carinae, Sagittarius, Ophiuchus and elsewhere, making initial estimates of their distance, diameter and extinction (Bok & Reilly 1947). He further claimed that these newly coined “globules” were gravitationally contracting clouds present just prior to star formation, comparing them to an “insect’s cocoon” (Bok 1948). As we will see, this bold prediction was confirmed over 40 years later to be correct. Today there over 250 globules known within roughly 500 pc of our sun and, as Bok claims in his 1977 paper, identifying more distant sources is difficult due to their small angular diameter and large number of foreground stars. There are currently four chief methods of measuring the column density within Bok Globules: extinction mappings of background stars, mm/sub-mm dust continuum emission, absorption measurements of galactic mid-IR background emission, and mapping molecular tracers. See Figure 1 for a depiction of the first three of these methods. At the time Bok published his paper in 1977, only extinction mapping and molecular tracer methods were readily available, thus I will primarily discuss these two. For a more in depth discussion, see Goodman et. al. 2009 and the subsequent AST201b Journal Club review. Figure 1. Three methods of determining column density of starless molecular cores or Bok globules. 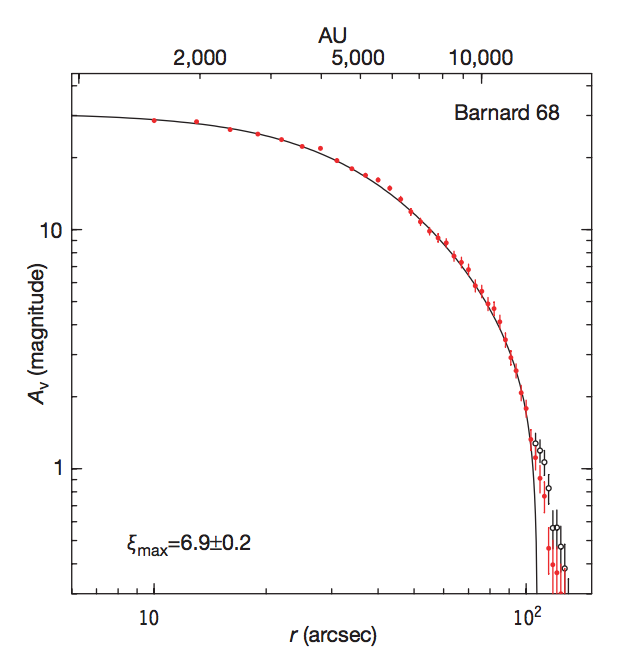 (a) K-band image of Barnard 68 and plot of the as a function of radius from the core. 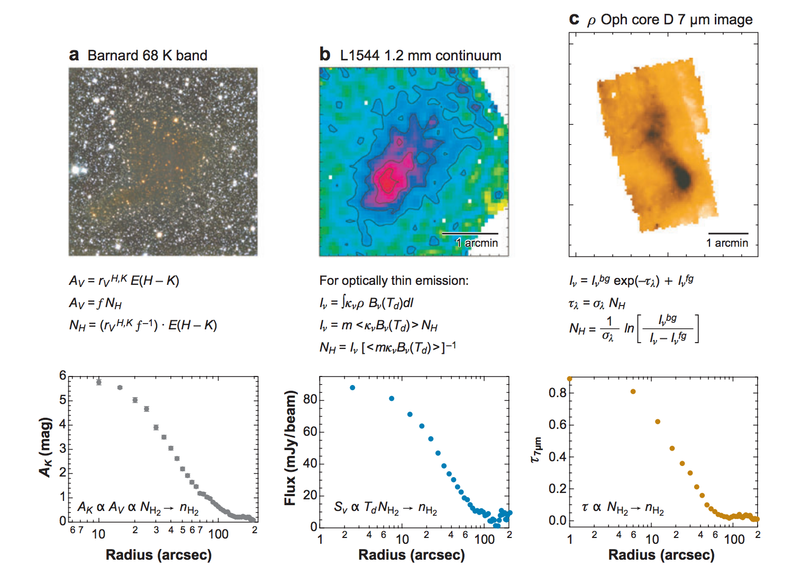 This method measures the H–K excess, uses the extinction law to convert into , and then correlated to the column density from UV line measurements, parameterized by f. (b) 1.2-mm dust continuum emission map and ﬂux versus radius for L1544. is the dust opacity per unit gas mass, ρ is the dust density, and m the hydrogen mass (corrected for He). (c) 7-μm ISOCAM image and opacity versus radius for ρ Oph D. In this method the absorbing opacity is related to the hydrogen column via the dust absorption cross section, . Figure taken from Bergin & Tafalla 2007. Measuring the photometric absorption, and thus yielding a minimum dust mass, for these globules is itself an arduous process. For globules with mag, optical observations with large telescopes can be used to penetrate through the globules and observe the background stars. Here . Thus an extinction value of mag means the flux is decreased by a factor of . By using proper statistics of the typical star counts and magnitudes seen within a nearby unobstructed field of view, extinction measurements can be made for various regions. It is important to note that the smaller an area one tries to measure an extinction of, the greater the statistical error (due to a smaller number of background stars). This is one of the key limitations of extinction mappings. For the denser cores or more opaque globules with mag, observations in the near infrared are needed (which is relatively simple by today’s standards but not so during Bok’s time). This is further complicated due to imprecisely defined BVRI photometric standard sequences for fainter stars, a problem still present today with various highly-sensitive space telescopes such as the HST. Bok mentions two methods. In the past a Racine (or Pickering) prism was used to produce fainter companion images of known standards, yet as discussed by Christian & Racine 1983 this method can produce important systematic errors. The second, and more widely used, method is to pick an easily accessible progression of faint stars and calibrate all subsequent photographic plates (or ccd images) from this. See Saha et. al. 2005 for a discussion of this problem in regards to the Hubble Space Telescope. Obtaining an accurate photometric extinction for various regions within the globule is valuable as it leads an estimate of the dust density. Bok reports here from his previous Nature paper (Bok et. al. 1977) that the extinction within the Coalsack Globule 2 varies inversely as the square of distance, thus also implying the dust density varies inversely as the cube of distance from the core. Modern extinction mappings, as seen in Figure 1(a) of Barnard 68, show that at as one approaches the central core the extinction vs. distance relation actually flattens out nearly to . This result was a key discovery, for the Bonnor-Ebert (BE) isothermal sphere model predicts a softer power law at small radii. In his paper, Bok remarks “The smooth density gradient seems to show that Globule 2 is […] an object that reminds one of the polytropic models of stars studied at the turn of the century by Lane (1870) and Emden (1907)”. It is truly incredible how accurate this assessment was. The Bonnor-Ebert sphere is a model derived from the Lane-Emden equation for an isothermal, self-gravitating sphere which remains in hydrostatic equilibrium. 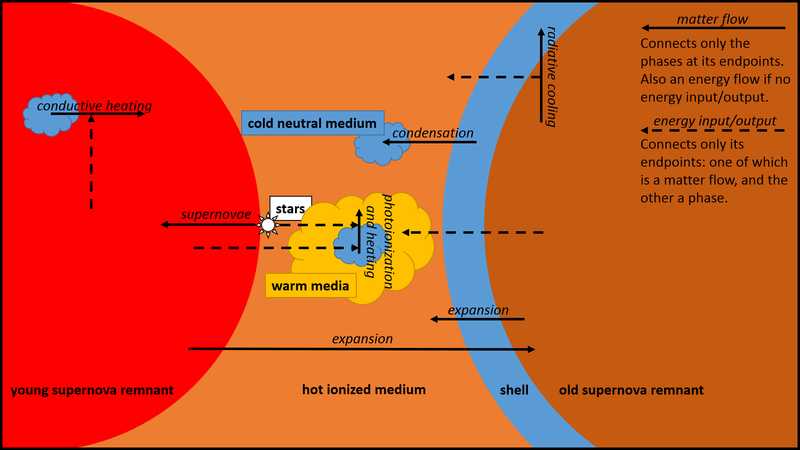 Figure 2 displays a modern extinction mapping of Barnard 68 along with the corresponding BE sphere model, showing that the two agree remarkably well. There are, however, a number of detractors from the BE model applied to Bok globules. The most obvious is that globules are rarely spherical, implying that some other non-symmetric pressure must be present. Furthermore, the density gradient between a globule’s core and outer regions often exceeds 14 ( ) as required for a stable BE sphere (Alves, Lada & Lada 2001). Figure 2. Dust extinction mapping for Barnard 68 plotted against an isothermal Bonnor-Ebert sphere model. Figure taken from Alves, Lada & Lada 2001. Important tracer molecules, such as CO, are used to study the abundance of , temperatures and kinematics of these globules. Because the more common isotope tends to become optically thick and saturate in regions of higher column density such as globules, the strength of emission is usually used to indicate the density of H2. The conversion factor of from Dickman 1978 has changed little in over three decades. The column density of , combined with its known mass and radius of the globule, can then be used to estimate the globule’s total mass. Furthermore, the correlation of density with photometric extinction, is another strong indication that emission is an accurate tracer for H and dust. Further studies using and have also been used to trace even higher densities when even can become optically thick(Frerking et. al. 1982). 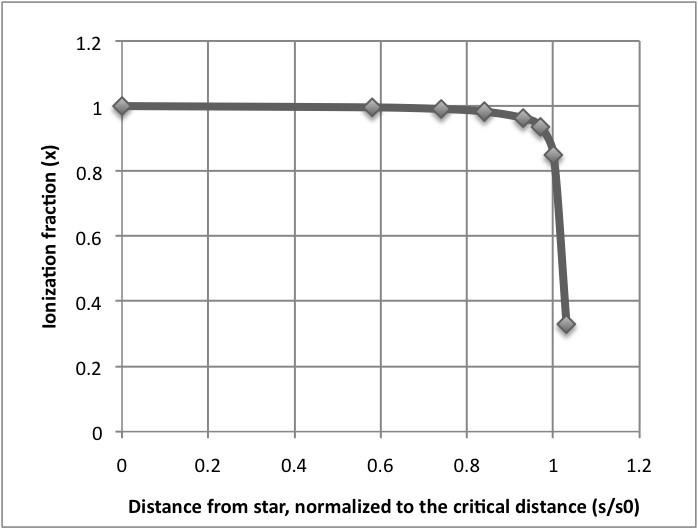 As an example, Figure 3 shows molecular lines from the central region of the high-mass star forming region G24.78+0.08. In the upper panel we can see the difference between the optically thick and thin . The line shows obvious self-absorption peaks associated with an optically thick regime, and one clearly can not make a Gaussian fit to determine the line intensity. , due to the small dipole moment of its transition and thus ability to thermalize at relatively low densities, is also used to measure the gas temperature within globules. These temperatures usually range from 7K to 15K. Finally, the width of CO lines are used to measure the velocity dispersion within the globule. As Bok states, most velocities range from 0.8 to 1.2 km/s. This motion is often complex and measured excess line-widths beyond their thermal values are usually attributed to turbulence (Bergin & Tafalla 2007). Importantly, the line-width vs. size relationship within molecular clouds first discovered by Barnard 1981 does not extend to their denser cores (which have similar velocity motions as Bok globules). Instead, a “coherence” radius is seen where the non-thermal component of a linewidth is approximately constant (Goodman et. al. 1998). In the end, as Bok surmises, the subsonic nature of this turbulence implies it plays a small role compared to thermal motions. Figure 3. 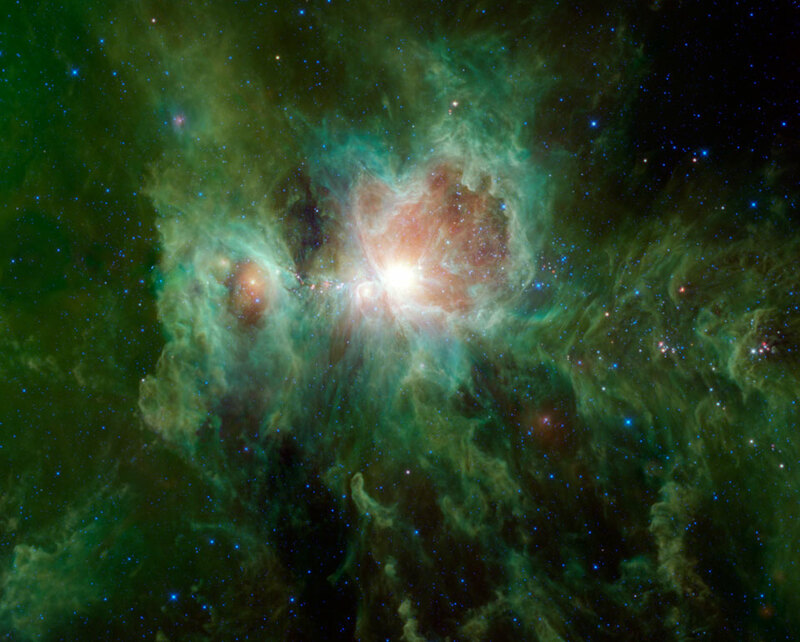 Spectra taken from the core of the high-mass star forming region G24.78+0.08. The solid line corresponds to , , and , the dashed line to , , and and the dotted line to . From the top panel, one can clearly see the difference between the optically thick, saturated line and the optically thin transition. Figure taken from Cesaroni et. al. 2003. Figure 4. (a) Contour map of the dust temperature of the Bok Globule CB60 derived from 60 and 100 μm IRAS images. (b) 12 μm IRAS image of CB60 after subtracting background emission using median-filtering. 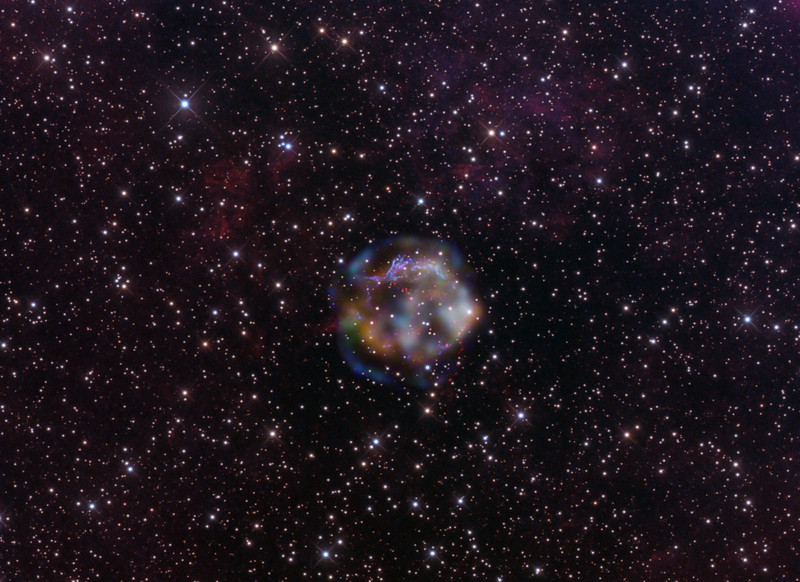 This source is thought to be a young stellar object or protostar located within the globule. The other 12 μm field sources seen in (b) are thought not to be associated with the globule. Figure taken from Yun & Clemens 1990. At the end of his paper, Bok makes a 180 degree turn and discusses the presence of young stars and blue globulars within the Magellanic Clouds. These star formation regions stand in stark contrast to the previously discussed Bok globules; they contain a rich amount of HI and comparatively small traces of dust, they are far larger and more massive, and they form large clusters of stars as opposed to more isolated systems. Much more is known of the star-formation history in the MCs since Bok published this 1977 paper. The youngest star populations in the MCs are found in giant and supergiant shell structures which form filamentary structures throughout the cloud. These shells are thought to form from supernova, ionizing radiation and stellar wind from massive stars which is then swept into the cool, ambient molecular clouds. Further gravitational, thermal and fluid instabilities fragment and coalesce these shells into denser star-forming regions and lead to shell-shell interactions (Dawson et. al. 2013). The initial onset of this new ( 125 Myr) star formation is thought to be due to close encounters between the MCs, and is confirmed by large-scale kinematic models (Glatt et al. 2010).